Fló Hnos were importing cards from Spain since the mid to late nineteenth century. 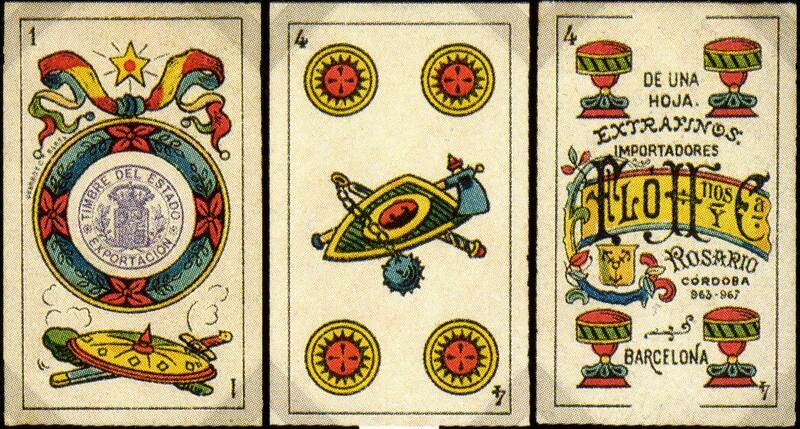 Left: two cards from a 48-card ‘El Ciervo’ pack in the popular Catalan style manufactured by Antonio Comas y Montaner (Barcelona, Spain), c.1900. 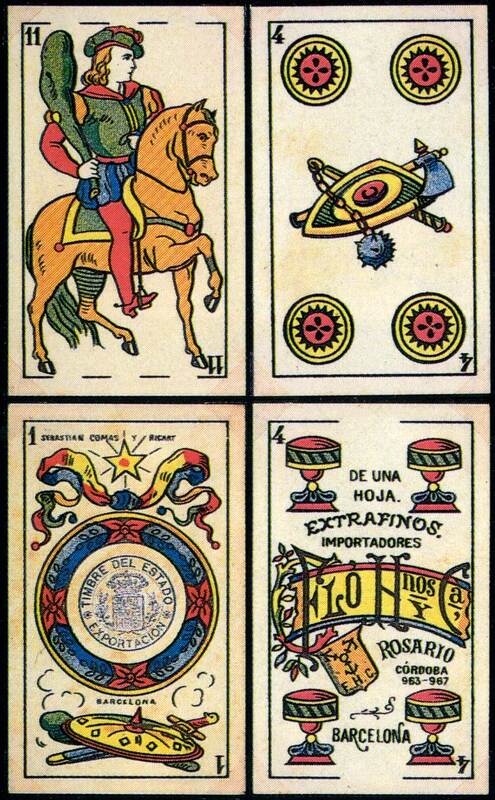 The four of cups states the name of Fló Hnos, Introductores, address: Córdoba 963-967, Rosario (Argentina). Fló Hnos y Cía are listed in the Registro Nacional de Patentes y Marcas for the years 1901 and 1903 as importers of playing cards, cigars, cigarettes, tobacco, snuff, cigarette paper, stationery, cutlery and ironmongery. The brand names "Snobs" and "F.H.C." were registered on November 27, 1902. Left: four cards from a 48-card ‘El Escudo Armado’ pack in the Catalan style manufactured by Antonio Comas y Montaner (Barcelona, Spain), c.1904. The four of cups states the name of Fló Hnos y Cía (address: Córdoba 963-967, Rosario, Argentina) as importers, and the initials F.H.C. can be seen in the small shield. Both examples on this page show the Spanish Exportation tax stamp on the ace of coins which was used from 1904-1931. Thanks to Juan Carlos Recarey for conducting new research. 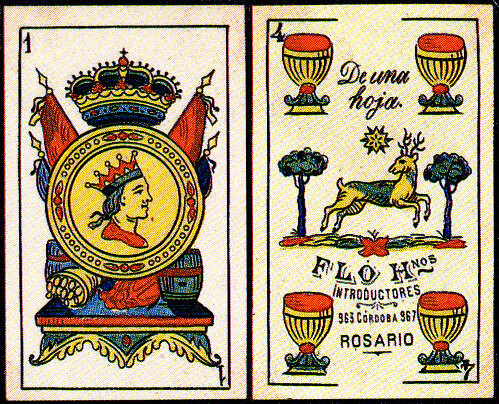 Left: three cards from a 48-card ‘El Escudo’ pack manufactured by Antonio Comas y Montaner (Barcelona) in c.1904 for Fló Hnos y Cía. See later example imported by Casa Bertrand Domec.